It appears the OVERALL and LARGE-SCALE atmosphere over the Northern Hemisphere is changing after being stuck for some 4 weeks in a high-latitude blocking pattern. The high-latitude blocking was instigated by a change in atmospheric pressure over the North Pole in which warmth travelled north and this forced the Arctic air that was incubated over the weeks which followed summer southwards. 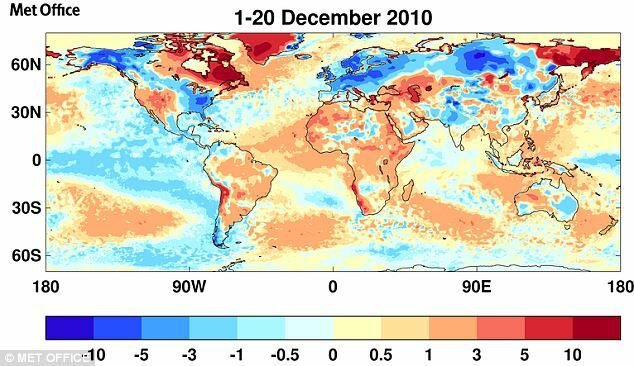 The work of both the North Atlantic Oscillation and the Arctic Oscillation and their amazing ability in bringing Arctic conditions to both the eastern USA as well as the northwest of Europe was fullfilled to the max. For the UK, the November 25-December 26th period was likely the greatest display of winter in at least 100 years. The power of the “negative” Arctic Oscillation dictates HOW COLD the air within these troughs get and with many reasons behind the stronger negative AO and NAO’s as well as their longer duration in a negative phase is debatable, although I have my own theories on this one. The last gasp of the negative phase of both oscillations was displayed in stunning style as the UK, having endured potentially it’s coldest December in recorded history indeed ended the month with the coldest Christmas Day on record with highs throughout barely topping freezing and the day which started with lows ranging from -10 to -18C (14 to 0F). 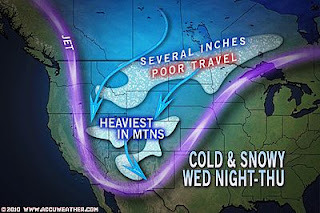 As for the USA, they saw a breathtaking blizzard impact the Northeast US, all but shutting down the corridor between Washington DC, Philadelphia, New York and Boston. It’s said, Central Park’s 20+ inch snowfall is the greatest December fall since 1948. 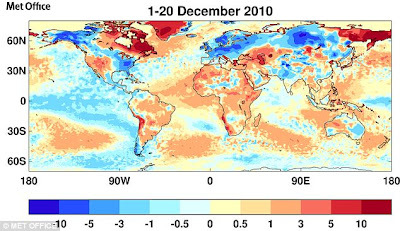 Now what will be interesting is as we see the transition from negative to positive, we’re looking at warming in the same areas that have been so cold. The UK has lost a great deal of snowcover over the past 36 to 48 hours following Boxing Day, nights are above freezing and days remain chilly, misty and murky where snow remains. Along the coast, temperatures are soaring to between 8-12C (48 to 52F) whereas just back on Christamas Day, a low of -18C was reported at Altnaharra, in far north Scotland. Even Boxing day saw most places struggle to reach freezing, sleet and snow was flying and temps which fell below freezing in most spots. 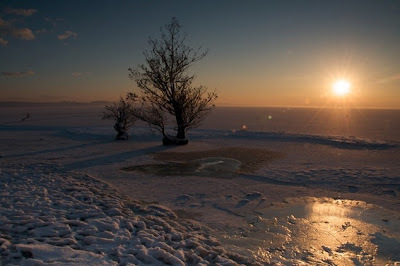 By New Year’s Day 2010, I believe it’s safe to say that all but the hills across Britain will have have and everywhere else will be bare once again but ice and frozen ground will continue to keep daytime highs stubbornly down and pavements and roadways slippery for some time. Look forward interior sections of the UK to continue seeing highs only at between 2-5C, eastern areas may continue to see only 2-3C as easterlies continue to chill North Sea coasts. The southwest of England, much of Wales, western Scotland and Northern Ireland will enjoy 6 to 12C highs..
After a major clean-up has been completed over the Northeast US, temperatures next week appear to be heading towards the 40s, whilst colder air filters into the Western US. Overall the cold pools will shift east and has already done so across Europe. I believe we’re entering a new 25 to 30-day cycle where mild Atlantic air will rule the show across Britain and western Europe whilst the core of cold will hit central and eastern Europe where a significant blast of winter will may folks from Warsaw, Berlin, Moscow shiver. For the US, from Reno, Denver, across to Minneapolis and Chicago, colder times will rule, whilst east of Detroit, milder weather will be the dominant feature of the weather… well, at least till late January.. 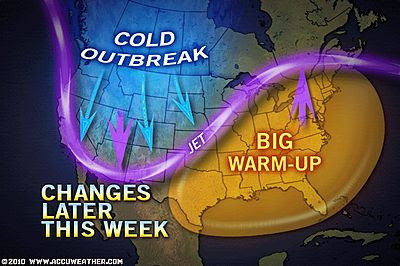 The final days of January may see a return to colder times for both the eastern USA and western Europe… Stay tuned! THE SNOW HAS BEEN ON THE GROUND ONE MONTH! After a 5″ dumping of snow on November 28th and a building of snowpack to a maximum of 8.5 inches in my back garden here in Lennoxtown, my garden is all but bare now but has seen a full calender month’s worth of snow on the ground nontheless. There was more snow this morning but thanks to persistent moderate rainfall and temperatures above freezing, the melt has contonued for some 48 hours nonstop, all be eroding the snowcover and leaving only old frozen snow piles behind! Though it’s likely Glasgow will end the month around 14 below normal, I wanted to point out the remarkable departure from normal the city of Glasgow, Scotland has seen this month. I would love to know whether this city has seen a lower departure from normal that was seen this month, perhaps there were even greater departures back during the little ice age, the period from the 1700s to late 1800s. The remaining snowcover is all but patches of old ice and frozen snow as persistent light rain continues to create a messy landscape of standing water and extremely slippery pavements and roads as this urban street flooding is freezing on the ground as surface temps are still well below freezing. However, despite still cool air and daytime readings only mustering 36 degrees despite mild Atlantic air back in control, the snow is near gone completely. Only patches of snow and ice remain. Temperatures held around the 3-4 deg C range throughout the day. I was caught out in an early morning April shower but the rest of the day was dry. Most of the snow has vanished from South-facing slopes. A terminal moraine is evident at the end of my road.